Frames are a great way to display favorite photos and showcase beautiful artwork, including quilts. But what if the frame itself was a quilt? A quilted frame could just as easily hold pictures, calendars, signs and – of course – quilts! The idea came to me as I’ve been designing a series of birth flower block-of-the-month designs. Obviously the twelve blocks could be sewn together into one quilt, but maybe it would be nice if each block could be bordered with a pretty appliquéd frame and switched in and out from month to month. I set to work to figure out how. 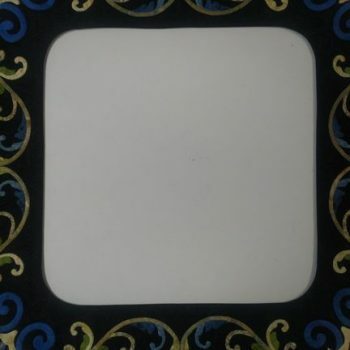 My frame was appliquéd onto a single piece of background fabric, leaving a 16″ rounded-corner square marked in the middle. The fabric was layered with a piece of batting, approximately the same size, and stitched along the marked line. 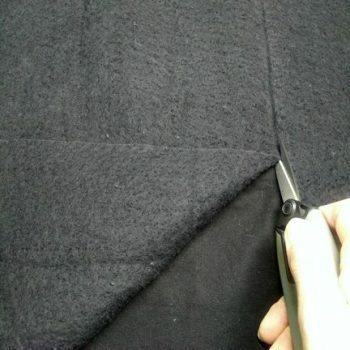 The batting was then cut away from the opening close to the stitching, leaving batting only under the appliquéd areas. The quilt top and batting were layered onto the backing fabric, right sides together, and stitched again along the same lines. The two layers of fabric in the center were cut away, leaving a graded seam allowance. 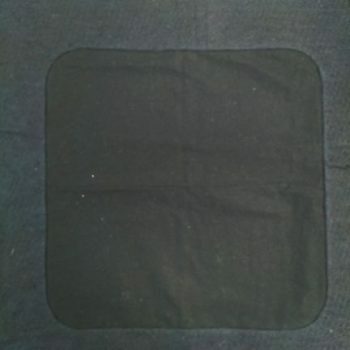 This means the seam allowance of one layer was narrower than the other, with the purpose of distributing the bulk of the extra fabric so it would not leave a visible line after quilting. The seam allowance was also clipped along the inside rounded corners. The quilt was turned right side out through the center opening and the edges gently pressed. By taping the center opening to the table and pulling the backing fabric taut, the three layers could be basted for quilting. 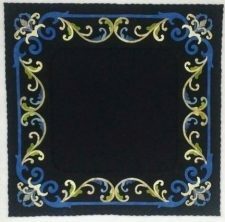 The appliquéd frame was quilted and bound like a regular quilt. (Click here for more information about the scalloped edge finish I used.) That was the easy part. The tricky part was figuring out the best way to insert my birth flower block-of-the-month quilts into the frame. After much trial and error, I determined that half-an-inch was the optimum overlap of the frame above to the inserted quilt beneath. 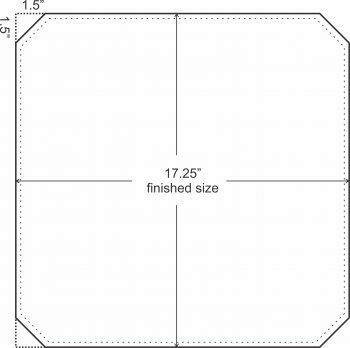 So with a 16″ opening in my quilted frame, my block-of-the-month quilts would need to be finished at 17″ to allow for this half-inch overlap on all sides. I also realized (the hard way) that the pocket that would hold them needed to be slightly larger again, or 17-1/4″. An 18-1/4″ square of fabric was cut for the pocket to allow for a double-fold quarter-inch hem. The corners were also cut off diagonally, 1-1/2 inches from the outside edge, and turned under with a double-fold quarter-inch hem. Right side up, the prepared pocket was centered over the opening on the backing side and pinned in place. Each long straight pocket edge was carefully hand-stitched to the quilt, taking care not to let the stitches pull through to the front of the quilt and leaving the corners open. Each 17″ quilt is inserted into the frame from the front and pulled taut through the open corners on the back. And voila! 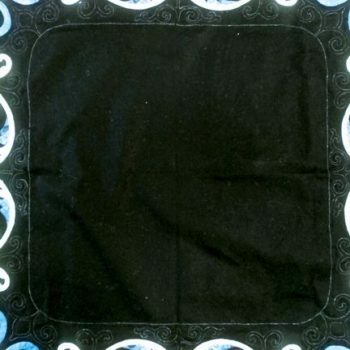 An appliquéd frame quilt. Pictured here are the January and September birth flower blocks inside the frame. Four more blocks are being quilted, block 7 is being appliquéd and block 8 is prepped and ready to go. Stay tuned for more information about the birth flower block-of-the-month block patterns – and border frame – coming soon! This is a great idea…thank you for sharing!